This is a little belated, but I figured I'd still share some of my thoughts from my 11 day trip to Kalikot! Well the journey to Kalikot culminated in bloody and infected feet, leach filled shoes, and a new, more developed outlook on Nepal. Prior to this trip, I had heard the kids talking about their villages, there village families, and the difficulty of life in Kalikot, however, it wasn’t until making the trip that I fully grasped the background of many of our Kopila kids. 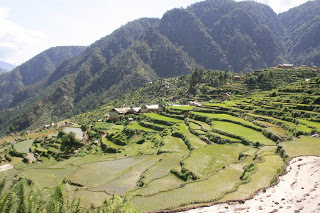 For those of you who don’t know Kalikot is a region north of Surkhet, and while its not too far distance wise, it is tremendously challenging to reach due to the mountainous terrain and underdeveloped roads. Additionally, Kalikot was the epicenter of Nepal’s civil war and its people suffered the most causalities and setbacks of any other region in the country. A yearlong curiosity inspired this trip, and I left on a rainy Wednesday morning with my good Nepali friend Sandip. The trip up was intense to say the least. Fortunately Sandip was related to the driver, and he let us sit up front which afforded us a bit more space. That said, the seats also gave us a front row view for a trip down one of the worlds most terrifying roads…This is not sarcastic, National Geographic has ranked Jumla Road between Surkhet and Mamna the world’s most dangerous. During the early portions of our trip, I realized where this reputation came from. About 4 hours into our drive we ran into a huge traffic jam, this jam was the result of mudslide on the road. After an hour of waiting and every able bodied man helping to clear the road, the cars, buses, and tractors began to make the perilous pass. Several faced some real difficulty and at times 15 to 20 people were out pushing vehicles around the corner. Fortunatley, our bus driver was a pro and made it through the pass easier than other…Unfortunately we ran into another mudslide about 30 minutes later which resulted in another longer delay. Unbelievably, this was the “easy” part of the drive, and Sandip said the scary part was yet to come. I learned what he was talking about shortly there after when news broke that one of the buses just in front of us “summersaulted” off the mountain. This crash resulted in 6 fatalities and over 30 severe injuries. Our bus actually provided water to the bus of wounded people driving down for medical attention in Surkhet. I actually felt tears welling up in my eyes as the bus of bloodied and battered people came driving buy. If I wasn’t on edge enough, a few hours later we reached the “scary part” also known as “S More”, this challenging corner involved the bus making a 3 point turn while teetering on the edge of a cliff. I regretted our front row seats immensely at this point and am sure I nearly cut off Sandip’s circulation while grabbing his arm through this terrifying sequence. After a few more harrowing hours we reached Mamna safe and sound, albeit my anxiety levels were through the roof. Upon getting out of the bus in Mamna, As we walked to the White House Hotel I quickly came to the realization that I wasn’t in the Nepal I had gotten used to over the previous 8 months. A common theme of this trip was exhaustion and me sleeping like a rock (despite some pretty dilapidated living quarters along the way) by about 9 each night. After a great sleep, we woke up to another rainy morning in Mamna, drank some tea, and waited out the passing storm. After a few hours, the rain let up and we began our adventure through Mamna and onto Sarabara. I have a number of people that were wonderfully helpful along the trip, and during this leg it was Karkha Singh who carried by bag for the entirety and expertly guided us to our destination. After being pent up in the bus for an entire day previously the 8 hours of walking was actually quite pleasant. During the walk we practiced Nepali, and I stated my goal of making big language strides during the trip. A goal which was quite easy to accomplish thanks to total immersion. In Sarabara we met Dil and Top Malla who served as our guides for the majority of our trip. They were amazingly helpful throughout, and not only helped me with my Nepali but helped me survive. One of the most challenging moments came during the morning of day three when we hiked from Sarabara to Chillkaya. In order to reach Chillkaya we had to cross a ridge, which entailed getting through the mountain town of Lubra. While not the worst part of the walk, this was certainly one of the scariest with a near vertical rock face that we had to ascend in order to get to our destination. It was at this point where I realized how incredibly strong and coordinated the Nepali people are. While I consider myself in good shape, this was a completely different type of workout compared to anything else I’ve put myself through. In addition my large frame and size 13 shoes did not help while attempting to step down through some tight passages. Lubra aside, we made it to Chillkaya, and I was blown away. It was easily one of the most beautiful places I have ever been. Like an oasis sitting in the middle of Kalikot, this village was full of fields and gardens and other flat area’s which seemed so odd having hiked exclusively through mountain villages. We had a wonderful night in town, met lots of kids and adults, and I was invited to speak at their village council meeting at the school that evening. Like everyone else we met on our travels the people were extremely kind and welcoming. After a wonderful evening in Chillkaya, we spent the next day in Kantampur visiting Sandips birthplace and family. This was a relaxing day which climaxed with a beautiful trip to the river where we bathed and hung out for a couple of hours. 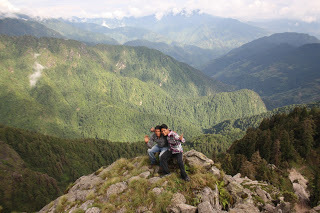 The next morning we set out to Oda, which is Tops (Kopila Co-Directors) home village. We stayed in his home, and the welcome mat was really rolled out in a big way. Unfortunately, on our first night in Oda symptions started emerging of an infection that I’m still getting over today. A mild pain that evening turned into an unbearable pain in my feet the next morning, which completely halted my ability to walk. Instead, I woke up the next morning to ankles the size of grapefruits. Evidently my bug bites got extremely infected leading to a full day of immobility. To make matters worse, medicine is nearly non-existent in Oda and we were forced to deal with my infection in the village way. This involved soaking my feet in scalding water and then draining the pus from my sores. While this sounds disgusting, it was so much worse than I can even convey over the blog. Despite my infected feet I decided to wake up the next morning and visit a school in a village called Romni, which is about an hour and a half away. This is where the 9th and 10thgraders who remain in school go when they finish school in Oda. Going into the walk I did not know how involved it was going to be and borrowed some sandals for the walk. This turned out to be a massive mistake, not only was the walk tremendously challenging in sandals…but due to the wrong sized sandals digging into my feet, another infection was formed which further limited my walking abilities. That said, visiting Romni was one of the biggest highlights from my trip. While visiting the school of 320 I learned that they had never been visited by a westerner and I was the first white person the vast majority of the kids had ever seen. They were shockingly shy, but so sweet and curious about their visitor. Sadly, our time in Oda came to a conclusion all too soon. Unlike some of the other villages, the number of Kopila relatives made Oda feel like a second home to me. The kids would all come to Tops house in the afternoon and by the time the sun was going down there would be 30 to 40 kids playing, talking, and observing quietly from afar. At this point we began the home stretch of our 11 day journey. After a 2 night stay in Dilikot, we began the long trip back to Surkhet. 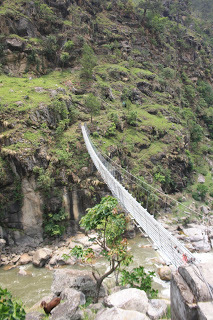 Unlike the trip to Kalikot, we decided against the walk in deference to a walk to Dailekh followed by a bus from there. 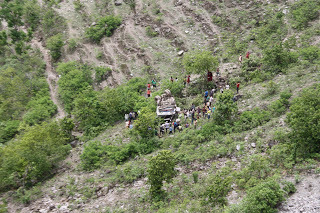 Since the beginning of the trip, I had heard lots about this walk, including the perilous mahabua where many people have died or had very serious injuries while attempting to pass. Our trip took two days, and started out at 10 am. The first 4 hours were incredibly challenging from a physical standpoint, and while I wasn’t afraid I was beyond tired as we walked uphill non stop for the duration of the morning. The next sequence was flat, albeit nearly as challenging due to a huge rainstorm that soaked our clothes and pinned us down in a small hut for over an hour. This rain finally did subside though, and we progressed towards the infamous Mahabua. For about 2 hours Dil Malla carried all three bags while gripping me tightly by my jacket. He was a great guide, that kept me from tumbling off the mountain more than once. The most extreme instance came on the “Lahina Pass”. During this portion Dil brought all the bags to the bottom, and returned so he could guide me unimpeded by bags. Additionally, he had me take of my shoes so I could get better traction and feeling on the wet rocks. At this point my feet were bleeding tremendously from the infections, and day of walking which resulted in a pretty gruesome site as I scaled down the rocks. I quickly see why Dil made both decisions. At one point, during this pass there was no path, rather there was two step stones roughly 6 feet apart. 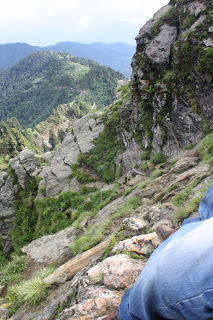 In order to get through, I was forced to hang from the mountain side, grasping onto whatever I could as Dil took hold of my shoeless feet to guide them to safety. After getting past Lahina, the path eased up a bit and we were able to walk at a good clip to Ukrabash, where we reached at 8pm. To make matters worse with my feet, after Lahina I didn’t put my wet socks back on my feet and just wore shoes. I learned when we reached ukrabosh that this was a mistake, and upon taking off my shoes was shocked to find my feet covered with several leaches, and bleeding even more profusely than they were earlier in the day. Thankfully, at this point I was exhausted, my feet were numb, and I really couldn’t have cared less about the leaches. At that point I was just ready to fall asleep so we could wake up and get to Dailekh. After a bowl of chow chow I went to bed, and slept like a rock until 5am, when we woke up for day 2 of our trip. Day 2 was pretty straight forward, and we reached Dailekh in 5 hours, got some lunch, and jumped on the first bus to Surkhet. The drive was only about 4 and a half hours, which was a welcome change to the Mamna drive. Tope and Maggie picked up Sandip, Dil, and myself from the bus park. It took me several days to write about this trip, and I’m actually sitting on the airplane right now to the States wrapping it up. 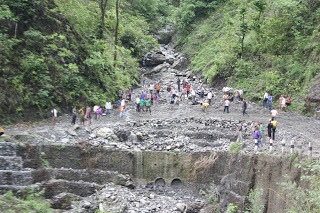 I think a combination of exhaustion combined with my farewell to Surkhet really slowed down my progress. Excuses aside, I learned a tremendous amount about myself and my desire to continue working in Nepal during this trip. The most startling, albeit comforting realization was that my bloody and infected feet combined with general discomfort did not lessen my desire. Rather, quite the opposite occurred, as sat there bloodied and battered my resolve hardened and my passion solidified. I came back from my trip with a unflinching certitude that this is where I’m supposed to be, and this is what I’m supposed to be doing. This confidence inspired me to talk to Top and Maggie in order to come up with a plan for my future. Well, the future is exciting but scary…In September, I am going to move back to Nepal and after a few weeks head up to Oda in order to work with the people up there and develop a project of my own. More on this soon, but very excited to know where I will be and who I will be working with for the foreseeable future.